Wait. I don’t have a financial advisor. And even if I did, it’s a myth that financial advisors can prevent losses. Nobody can predict short-term stock market movements. If you’re in the stock market, you’ll have losses sometimes. Wait. I didn’t do that. There is always uncertainty in markets, even if our faulty hindsight makes the past seem less risky. The fact that markets dropped in the last few months of 2018 tells us little about the near future because momentum effects are too weak. In reality, I stuck to my chosen asset allocation which includes a mix of stock ETFs, and a mix of cash and GICs to cover 5 years of my family’s spending. I use threshold rebalancing calculated on a spreadsheet that emails me whenever I have to do any trading. The truth is that I wasn’t paying much attention to stock markets during 2018. 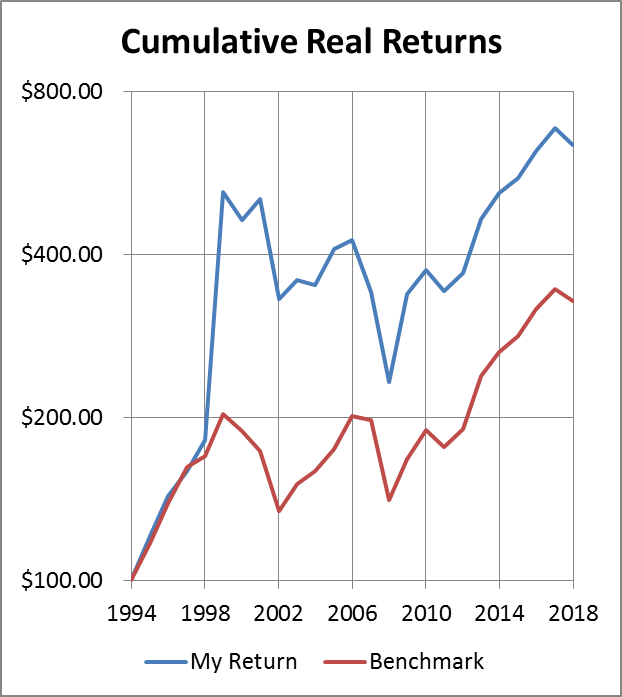 Each year I calculate a benchmark return to compare to my actual return. The fact that my portfolio now has a substantial cash and GIC allocation moderates both my actual and benchmark returns. For 2018 the benchmark return was -3.2%. So, why did my portfolio do worse than the benchmark? My benchmark is based on time-weighted returns, which means it assumes no deposits or withdrawals. I calculate my actual returns with the internal rate of return (IRR) method. Shortly before the stock markets started dropping, I made a substantial deposit to my portfolio. The timing of this deposit was unlucky and not something I was able to control. That little drop at the end was 2018. It’s been a bumpy ride, but I’ll take the stock market volatility to get it’s high expected returns. My compound average real returns have been 8.02%. However, I base my spending on future 4% real returns for stocks (before taxes and other costs) and 0% real returns for cash and GICs. I should comment on my spectacularly lucky 1999. My portfolio nearly tripled when I took an insane risk that happened to pay off. I could just as easily have lost 80% that year. I’ll never knowingly do anything remotely that risky with my portfolio again. Now that I’m retired and don’t have a regular paycheque to help keep me from worrying too much about stock market risk, I’ve got my 5 years of cash and GICs to keep me napping while stocks try to get my attention. I’d rather meet up with friends than spend any time agonizing over stock prices. 1) Your return seems not terribly high over the past 20 or so years (after your big lucky winner). 1998 looks to be about ~500% on the chart, and 2018 perhaps ~700%? That would make your return over 20 years about 40%, or something less than 2% per year...? Is that right? Especially given your 100% allocation to stocks (I think? )..to what do you attribute this? Is this a money-weight vs. time-weight factor / timing of your contributions? 2) I'm also curious about how you implement your "cash on hand" strategy. You mention you keep 5 years in cash/GIC - I think you have said in the past here is that the idea of having a 5yr "buffer" is to avoid sequence of return risk...that in the event stocks have a bad run, you can dip into the buffer & not have to sell down your core portfolio that year. I am curious as to the rules you apply to make that decision? Was 2018 a year after which you will not sell, and draw down a year of buffer? @Anonymous: The chart shows cumulative growth over the years rather than each separate year's returns. Also, these are real returns, meaning after subtracting out inflation. 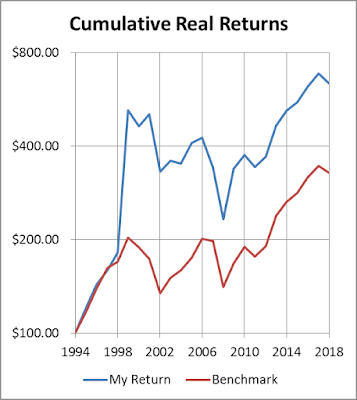 My real return for 1999 was 185.6%, and for 2018 my real return was -6.8%. My compound average real return over the full period is 8.02% per year, which is high and mainly due to luck. Each year, my spreadsheet takes my overall portfolio value and my age to compute a safe spending level for the year. Then I sell enough stocks to bring my cash/GIC level to 5 years of this spending. Over the year, I spend from this cash so that I'll likely have to sell more stocks the next year. If stocks have a bad year and my portfolio is down, the calculated 5 years of cash will be down as well. This means selling less stock. If stocks have a major crash, I might not sell at all based on this calculation. So, for example, suppose I start with $250,000 in cash and spend $50,000 over the year to bring this down to $200,000. But stocks went down so that my safe annual spending calculation goes down to $45,000 per year (or $225,000 over 5 years). Then I'd only sell $25,000 in stock instead of the expected $50,000. After stocks have a good year, the calculation would have me sell more stocks. I don't leave any of the decisions up to my "gut." Hi Michael, I am recently retired and have set up a 5 year buffer of cash and GICs. You say that you compute a safe spending level based on your overall portfolio value and your age, what other factors do you include in your equation to arrive at your safe spending spending level for the year? This is how I'm running my own finances, but you'll have to decide for yourself whether it will work for you.